The next Thursday 24 We repeat the first of the seminars for artisans "Activa’t"Organized by the Provincial Council of Tarragona. This time, the 2 sessions that form the course will be held in Tortosa. In the first one we'll see how it should be the website of a craftsman, with what tools could create it and also see the techniques to drive traffic to your website with minimal cost. The second session will see the techniques to convert visitors into business contacts and web analytics. 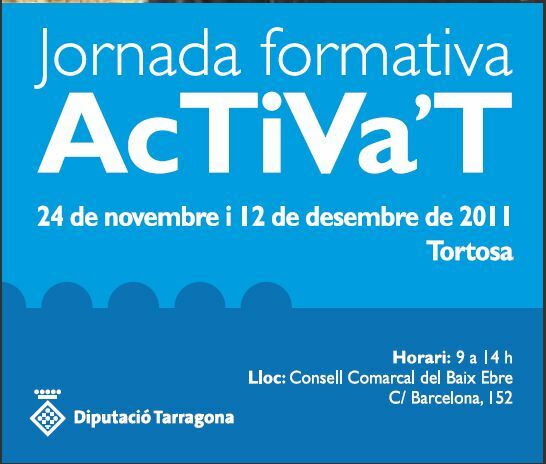 These seminars are open to all artisans in the province of Tarragona and will be held on 24 November and 12 December. Classes will be held in the Regional Council of Lower Ebro, C / Barcelona, ​​152 Tortosa. Hours are from 9am to 14pm with a short break at midmorning. Admission is free but seating limited. If you are interested in attending them, please contact as soon as possible with Local Development Service of the Diputación de Tarragona (desenvolupament.local@dipta.cat) Or call 977249488. I had the pleasure of participating this morning in Diversons , An initiative of the Social Work "The Caixa"Which aims to help novice musicians in their professional training, while promoting understanding of different cultures through music. My participation has been among the acts of organized training to help professionalize bands, and have taught a session in which I explained what Web 2.0, how it should be a web 2.0 site and what tools we can use to publicize the website of a band, and how we can promote music through social networks and many other web 2.0 tools that are available to any group that knows his way around the Internet. The presentation that I used to illustrate my paper is as follows. I hope you find it useful. We talk to each other. A hug. 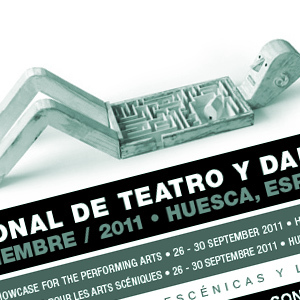 Los días 28 y 29 de septiembre de 2011, la Plataforma Convivencia Pirineos Mediterráneo en colaboración con la Feria Internacional de Teatro y Danza de Huesca organizan el Encuentro profesional transfronterizo “Las artes escénicas en la era digital”. Por mi parte, tengo el placer de participar en estas jornadas ofreciendo una charla sobre “los 10 errores que cometen teatros y auditorios cuando plantean su comunicación online". En esta ponencia trataré temas como el posicionamiento en buscadores, la usabilidad, los gestores de contenido, la web 2.0, el objetivo que debe tener un sitio web, etc. En total, una hora y media repasando algunos de los errores más comunes realizados por empresas del mundo cultural y sobre todo, por teatros y auditorios, cuando crean sus webs y cuando se plantean realizar acciones de Marketing Digital. En las jornadas participarán muchos otros profesionales de diversos ámbitos relacionados con la cultura y el mundo digital, así que por mi parte, estoy segura de que será interesantísimo poder asistir a sus disertaciones. El plazo de inscripción está ya cerrado, pero por si acaso aun quedasen plazas o por si deseas más información sobre el evento, aquí encontrarás lo que necesites: “Las artes escénicas en la era digital”. Slides "10 tips to improve online business communication Audiovisual"
Yesterday I had the pleasure of participating as a speaker at the 2011 edition of Audiovisual Market of Catalonia. This fair, year after year, brings together audiovisual professionals who are somehow related to what is known as "local television" ... what is commonly called local television. For my part, I participated imparting aimed at offering modest assistance in the form of 10 tips to improve online communication companies present at the event presentation. I used slides to illustrate my paper are as follows. https://www.montsepenarroya.com/wp-content/uploads/2017/09/MP-Logo-Web-1.png 0 0 Peñarroya Montserrat https://www.montsepenarroya.com/wp-content/uploads/2017/09/MP-Logo-Web-1.png Peñarroya Montserrat2011-06-09 22:31:422011-06-09 22:32:11Diapositivas de "10 consejos para mejorar la comunicación online de empresas Audiovisuales"
On Wednesday I had the pleasure of giving a presentation on Video Marketing applied to Cultural Industries organized by the BDS (Business Development Service) the ICIC (Catalan Institute of Cultural Industries) in the Auditorium of the Museum Colet. In the two and a half hours long event saw what the Videomarketing, what it is, how we can apply it to disseminate cultural works (whatever type they are), and also how we can apply it to promote our businesses. We also saw the factors to consider when creating a video and make it known on the network as well as the key factors of success of the strategy itself. I used slides to illustrate my talk are as follows. Yesterday I had the pleasure of participating in the conference that have title CiudadesVillesCiutats 3.0 which they took place in Huesca for 2 days. The program of the conference was interesting (although I missed the Tuesday afternoon with the inaugural lecture given by Javier Celaya and the round table was entitled "Gazes around digital creation"In which they participated Radigales Enrique, Jose Antonio Galaso, Franck Bauchard and Paula Blesa as moderator). One of the talks I attended to itself was to Marc Le Glatin (author of the book " Internet: an earthquake in culture?") Surprised me by his vision of how it should be the funding of culture (co-funded by all and distributing earnings per use) and the idyllic world that believes (I envy [healthy] to be able to think that something this is possible in our society). In this link you can see the "Event participant" created by @Culturepunk (José Ramón But) in which all the tweets made by participants (and non-contact) are collected during the event. You can also see it in Twitter if you follow the hashtag # cv30. And the tweets of my 10 mistakes can see summarized in this document preparado by Oscar Ciuró from the tweets Think Joseva. I take these lines to thank all attendees who tweeted the conference (my paper included) and especially the organization of the event, which was flawless in every way. A big hug to everyone. I just hung on my account Slideshare the slides that I used last February 23 at the conference on culture 2.0 Teaching at the Centre d'Art Santa Monica, organized by the BDS (Business Development Service of the Catalan Institute of Cultural Industries). The talk aimed to help cultural businesses develop their strategies for Web 2.0. To do this, we try what is Web 2.0, how it differs from 1.0, what tools can be useful for us to promote our cultural enterprises, which are key factors for success and where internet evolves. My next appointment with the SDE will be next March 28 in the first of the days of Digital Marketing Course for Cultural Industries. I go all right. See you there.